The vox populii, the voice of the people, has become the vox Alli, the voice of Allah, following the stepping down of long-time president Murbarak. 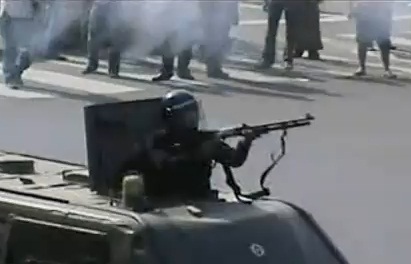 Egyptian military fires at protesters during the recent uprising. According to sociologist and adjunct lecturer at the Jamaica Theological Seminary, the Rev Peter Espeut, “The people of Egypt have decided that they have had enough of corruption, bogus elections and cronyism.” The historic demonstration has come close on the heels of parliamentary elections a few weeks ago in which Mubarak won by a landslide. The government under the Mubarak administration also cracked down on freedom of the press, and on October 19 last year, suspended the licenses of 12 TV channels, after a previous ban on five stations. The pyramids of Egypt are the only surviving artifact of the magnificent seven wonders of the ancient world, and they are as fascinating as the history and politics of that country. As the oldest superpower around today, Egypt has been through many and varied structures of governance, both as a people subject to others or as nation subjugating other peoples. For example, recently a Jamaican Old Testament scholar, Dr Stephen C. Russell, has pointed out that in the sixteenth century BC, Asian foreigners ruled the country and were later expelled by Thutmose III. We are more familiar with the Egyptian hegemony of the then known world in which the Israelites were enslaved for a period not exceeding four hundred years. This fact of Africans enslaving Asians for such a long period of time is seldom mentioned if any at all by those for whom Black History month is so vital. What is a pity, though, is that the Jewish people have made much of their Exodus from Egypt and their Exit from Babylon but those in the African Diaspora and in the motherland seem oblivious to the need to unify themselves around their common history of oppression. This sad situation has made Marley’s call several decades ago for Africa to unite fall on deaf ears. But what is happening to Egypt today may be the catalyst to a pan-African political revival that will cause Marley and Garvey to turn in their graves with fulsome anticipation of a brighter future for the continent that many regard as the cradle of civilization. The parallel with slavery in the Caribbean in the 18th century AD and that of the Jews in the 14th BC is difficult to miss: both the enslaved in Africa and in the African Diaspora chafed under the yoke of the Great House. But I don’t really believe in those falling things at all. With the abundance of archaeological and historical evidence available today, it is time people of African descent stop using the bible as a source of history, especially for our history. The bible is a book of myth that was plagiarized primarily from ancient Egyptian mythology. Hieroglyphs on the chamber walls and corridors of pyramid tombs, and on coffins and sarcophagi of particular kings, attest to the origins of the bible while others provide the political, religious, economic and social conditions of ancient Egypt. The resounding silence of the pyramids on a group of people called Israelites being present in ancient Egyptian goes far in concluding Egyptian enslavement of them never happened. Archaeological and historical evidence show no ‘Israelite’ presence in ancient Egypt, and certainly no mention is made on any pyramid or stele of an exodus amass through ancient Egypt’s heavily guarded walls, as all other major events were recorded. But the reign of th 18th Dynastic Pharaoh Ahmose gives a tantalizing account of the expulsion of the Hyksos–Semites–from Egypt to Canaan, which is more likely the origin of the distorted mythical Israelite exodus.